We still have a HUGE need for overnight volunteers! Anyone interested in helping will be trained on the job. You may stay your first night with a seasoned volunteer if needed. Please take a look at the following information and let us know if you can fill in on any of the days needed. Even if you can only do a couple days a month, please sign up for those days online. Milford Nazarene is still in need of female overnight volunteers for every other Friday night, some Saturdays, Sundays, Mondays, Wednesdays, and Thursdays. Milford Avenue is still in need male volunteers for some Fridays and Mondays and any other blank spot on the calendar. Please fill out an online volunteer form here Volunteer Registration Form. Here is the link to sign up on the calendar. Milford Calendars. Bethany: Stone House is still in need of lots of overnight female volunteers. We haven’t opened in that area for lack of them. Please contact us at codepurplesussexcounty@gmail.com to let us know what days that you have available so we can plug you into the schedule. Laurel Nazarene will open January 1st and is still looking for 2 male overnight volunteers for Wednesday nights. Please fill out a volunteer form here Volunteer Registration Form. 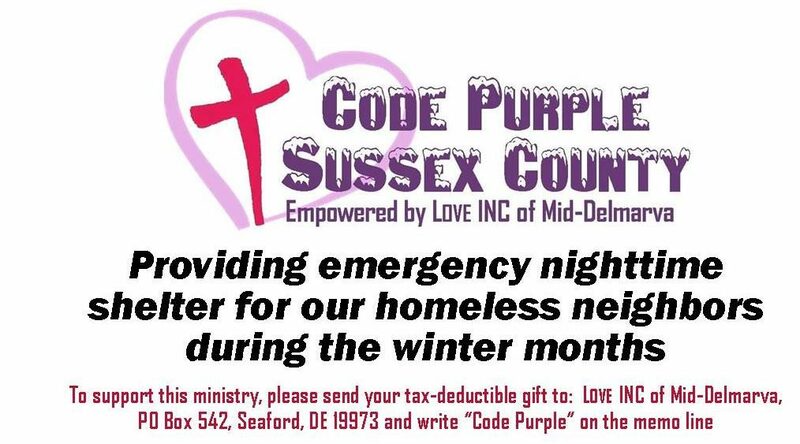 Please email us at codepurplesussexcounty@gmail.com to let us know if you can help us! Georgetown Presbyterian operates as a partnership. We are trying to build up their volunteer base at this time. They are open regardless of volunteers but we would love to see the community get more involved. Please fill out a volunteer form here Volunteer Registration Form. Here is the link to sign up on the calendar Georgetown Calendar. Delmar is not struggling like the other shelters but we welcome the extra help so we don’t burn out any one person. Please fill out a volunteer form here Volunteer Registration Form. Here is a link to sign up on the calendar Delmar Calendar. It’s Cold Outside! OPENING for the season! Please email us at codepurplesussexcounty@gmail.com for any further questions. We are so thankful for all of the support that we receive from the community. You guys are awesome! If you are experiencing homelessness and need shelter, please call our hotline at 302-519-0024. Limited Opening Monday 11/26/18 through Thursday 11/29/18! We are pleased to announce that we will have some shelters available starting Monday night! We don’t have enough volunteers to open every site but hopefully, people will start signing up soon that we can provide safety and warmth each night this winter. Milford: Dinner will be held at 7pm at Congregation of the Most High Yahveh located at 9 S.E. 2nd Street, Milford, DE 19963. Then the ladies will go to Milford Nazarene ( 11 Salevan, Milford, DE 19963) and the men to Milford Avenue (20 N Church Street, Milford, DE 19963) to sleep for the night. Delmar: 7pm at Renovate Church (800 E. East Street, Delmar, MD 21875). Dinner is provided on site. Seaford: Dinner will be held at 7pm at The CROSS Building: 703 East King St., Seaford, DE 19973. The ladies will go to Gateway Fellowship (8110 Cannon RD, Bridgeville, DE 19933) and the men will go to St Luke’s Parish Hall (202 N North Street, Seaford, DE 19973). Georgetown, DE 19947 will open at 9pm with a light dinner provided. Click here for a complete list of shelters Shelter List. We are in need of many more overnight volunteers. It isn’t looking like we can open each shelter each night. Please consider giving us a few nights of your month! Click here to fill out a volunteer form. Volunteer Form. Check out our calendars here and sign up for any day that you would like to help us! Volunteer Calendars. There are many emotions that bombard us as the beginning of the season approaches but excitement supersedes them all! We love being able to provide a safe sanctuary for those with no place to call home. We do depend on the community to help us achieve our goals for the winter so we are here to update you as well as ask for further assistance. We will be opening up for ON CALL nights starting November 25th. We are still waiting on some supplies to be delivered. We also still need the community to donate all the items found on this list. Donation PDF The addition of four new shelters has added to the amount of donations that we need. We are a non-profit, volunteer run organization therefore everything that we receive goes straight to the needs of those we serve. We do have a donation coordinator this year. Yay! You can reach Amanda Mitchell at codepurplesussexcounty@gmail.com or call 302-632-8180. Our Director, Nikki, would love to come and speak to your church or organization so they can hear how Code Purple changes lives as well as how they can become involved in being a part of that change. Please email us with any further questions at codepurplesussexcounty@gmail.com. We can not do it without your help! Please spread the word and also consider being apart of our ministry. Trust us, you will be the one blessed. The Code Purple Sussex County Team! Training Coming Soon to a Town Near You! Sign up now! We are very busy cleaning, sorting, arranging, meeting, and setting up for the new season! The addition of four new sites has been a huge blessing! We will be able to serve more guests this winter which means Code Purple needs more help from YOU in the community! Remember, we are a 100% volunteer and donation based ministry that wouldn’t be possible without your help. We have several different opportunities for you to attend a training before the start of the Code Purple season. (You must attend a training in order to help at any of our locations. Each training will teach the same information so you only need to complete it one time.) Please click on one of the Face Book event links below to let us know which one you will be attending. Can’t wait to see you there! !